(CNN) -- The last time Terry Williams can remember being headache-free was in December. A chronic migraine has plagued her ever since. So have balance and vision problems, a tremor in her left arm, a prickly sensation in her feet and a loss of childhood memories. 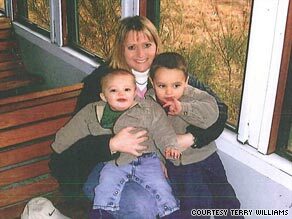 Terry Williams hugs her two boys -- Jake, left, and Zack -- in 2006, before she says toxic cabin air made her sick. The ailments, she says, began April 11, 2007. Williams, then a veteran American Airlines flight attendant of 17 years, noticed a "misty haze type of smoke" on Flight 843 as it taxied toward a gate in Dallas, Texas. That "fume event," as it is known, and the physical maladies she felt afterward drove Williams, 40, to file a product liability lawsuit late Tuesday in Seattle, Washington, against Boeing and McDonnell Douglas, aircraft manufacturers linked to the MD-82 aircraft she was on. Her claim: Toxins in the cabin's air made her sick, and a design flaw -- the lack of filters and sensors -- left her unprotected. They "knew or should have known that toxic nerve agents, contaminates, and dangerous fumes could bleed into the plane's ventilation system, causing serious and irreversible health effects," her attorneys said in a written statement. Boeing spokesman Todd Blecher said he was "aware of the lawsuit" but couldn't "discuss details of it at this time." McDonnell Douglas is no longer in business. It merged with Boeing in the late 1990s to form the Boeing Co., so Blecher said he spoke on behalf of both entities. "Since we're not named in the suit and it was just filed, we have no comment at this time," said Tim Wagner, a spokesman for American Airlines. "We'll watch the lawsuit as it progresses." Between a tickle in her throat, cough and headache, Williams thought she had the start of a common cold when she stepped off the flight in question. But she says the symptoms grew worse and included a nasal discharge she described as "neon green, the same color as antifreeze." Within several weeks, Williams says, she had to make repeated visits to emergency rooms before a neurologist told her she'd been the victim of toxic exposure. Leaks in the seals that keep engine oil in place could cause chemically laden fumes to enter the air stream, said William Nazaroff, a professor of civil and environmental engineering at University of California, Berkeley. "A specific chemical of concern is tricresyl phosphate," he said, a chemical compound used in nerve agents and pesticides. "Historically, there have been some neurotoxic health consequences from high human exposures to [tricresyl phosphate]." How often "fume events" happen, and how often they are reported, is disputed. A National Research Council report in 2002, using data from three Canadian airlines, said that on one aircraft model, nearly four out of 1,000 flights had a fume event. The Committee on Toxicity in the United Kingdom, a group made up of independent experts who advise government agencies, said in September 2007 that pilots reported events in 1 percent of flights and that maintenance inspected and confirmed incidents in 0.05 percent of flights. "These frequency estimates may all sound low, but consider that there were 10.65 million flights on U.S. registered aircraft in 2008. Even 0.05 percent of flights translates into about 14 events per day," said Judith Murawski, an industrial hygienist with the Association of Flight Attendants-CWA, who has studied the issue for more than nine years. Most of the flying public has never heard of "fume events," and employees, especially in this economy, may stay mum for job security reasons, Murawski said. Flight attendants who become too sick to work -- and Murawski estimates that there have been hundreds -- usually file a workers' compensation claim, which Williams has also done. The Federal Aviation Administration does not dismiss the possibility of fume events and the potential health dangers. "The concerns are reasonable and are being investigated," the agency said in a written response to CNN's questions about the issue. "These symptoms" -- including memory loss, vision impairment, tremors, headaches and vomiting -- "have been attributed to exposure to tricresyl phosphate (TCP) and other breakdown products of hydraulic fluid, fuel, deicing fluid and engine oil," it said. The statement also said, however, that the same symptoms occur as a result of other neurological conditions. The FAA said researchers at seven universities involved in Airliner Cabin Environment Research are trying "to assess the level of exposure to toxic chemicals in aircraft and to correlate any verified exposures with crew and passenger symptoms." The first known written report about exposure to toxins on airplanes -- entitled "Human Intoxication Following Inhalation Exposure to Synthetic Jet Lubricating Oil" -- was submitted in 1977 by a team of doctors, including those affiliated with a pulmonary-toxicology lab at a VA Hospital in Minneapolis, Minnesota. Their investigation focused on a case of a "previously healthy" 34-year-old military pilot who became "acutely incapacitated" while flying after being exposed to "aerosolized or vaporized synthetic lubricating oil," the doctors wrote in the report. They said further investigation was "definitely warranted." In 1986, the National Research Council, an operating arm of the National Academy of Sciences and the National Academy of Engineering, conducted -- at the request of Congress -- an independent study and produced a report entitled "The Airliner Cabin Environment: Air Quality and Safety." In this, the council raised myriad concerns about air quality in cabins, including exposure to contaminants. The research council was enlisted again by Congress about 15 years later. The result was the 2002 report "The Airliner Cabin Environment and the Health of Passengers and Crews." In its own language responding to the NRC's recommendation regarding air quality and ventilation, the FAA said it "has not kept pace with public expectation and concern about air quality" and cannot guarantee protection from contamination "because no airplane design incorporates an air contaminant monitoring system." In its statement to CNN, the FAA said it "supports all of the NRC's recommendations and continues to monitor the development of data on cabin air contamination to ensure the health of the flying public." Christiaan van Netten, an environmental toxicologist in Vancouver, British Columbia, Canada, devised a simple device to measure air quality on planes. Seventy-five of the hand-held monitors were used in a study conducted by the Occupational Health Research Consortium in Aviation, a project that was funded by the FAA. Van Netten says he's not at liberty to talk about the results because this report was submitted last month and is being reviewed by the FAA. But he said more comprehensive and transparent air-quality testing would only help the industry. "When you don't have access to real information, people go from one extreme to another," he said. "By not addressing the facts, you open yourself up to all sorts of wild speculation." Tristan Loraine, an English pilot who said he was forced to retire because contaminated bleed air made him sick, thinks the airline industry is more concerned about profits than protecting passengers and employees. His experience drove him to create a documentary titled "Welcome Aboard Toxic Airlines." He and others say it's difficult for doctors to diagnose exposure and that the effect on individuals -- based on differing immune systems, enzyme levels, medications -- varies dramatically. For this reason, there's a chance Williams alone may have reported a reaction to the fume event on her flight. Clement Furlong, a research professor in the departments of medicine and genome sciences at the University of Washington, has worked since 2005 to develop a simple blood test to determine whether a person has been exposed to contaminated bleed air. He says he's getting close. "If we have 10 boxes to check to be there, we've checked off nine," he said. Terry Williams is not the only person claiming ill effects of bad cabin air. Her attorneys also represent twin sisters, 45, who say they were sickened on a Southwest Airlines flight in January -- one that was diverted for what they called an "unexplained malfunction." A spokeswoman for Southwest Airlines, Brandy King, confirmed that the flight had been diverted but would not say why and would add only, "We are actively collecting information and reviewing the sequence of events." Another aviation attorney out of Chicago, Illinois, represents 20 U.K. passengers who say they became sick two years ago on a charter flight to Orlando, Florida. "There's been enough research to show that indeed this is a problem, and it's now time to implement solutions," said Christopher Witkowski, director of air safety, health and security for the union AFA-CWA. The issue gained traction in the mid-1990s, Murawski says, because by then most airlines had banned in-flight smoking and people began noticing other smells and hazes. But after September 11, she says the industry's priorities turned full-throttle to an entirely different safety issue. Those concerned about fume events point to recent developments that give them hope. The new Boeing 787 Dreamliner, set to roll out soon, does not use bleed air and instead compresses atmospheric air from outside the plane. Blecher, the Boeing spokesman, said electrical system advances that improve efficiency -- and not concerns over bleed air -- inspired the change. Meanwhile, the FAA Reauthorization Act of 2009, which passed in the House and is now in a Senate committee, calls for research and development of sensor and air cleaning technology to remove "oil-based contaminants from the bleed air." The Australian government's Civil Aviation Safety Authority set up an Expert Panel on Aircraft Air Quality to review this issue. And on Wednesday, the United Kingdom Parliament held a debate about aircraft air quality, specifically discussing design flaws that might expose people to toxic fumes. Williams, who lives outside Seattle and has 3- and 4-year-old boys, said she's pursuing the lawsuit because she doesn't want others to suffer. "I'm often unable to play with my children. I feel like I'm depriving my kids of a mom and my husband of a wife," she said, her voice cracking. "I walked off that plane and have never been the same. ... If I can educate anyone and help raise public awareness to stop this from happening, hopefully changes can be made to keep people healthy."